Read below for the latest developments in the union, including grievance victories, visits to legislators, settlements, and bargaining updates. Workers at the University of Southern California’s Center for Advanced Lung Disease and Cystic Fibrosis voted unanimously June 14 to join NUHW. Nearly 100 workers at various USC clinics have voted to join NUHW in the last several months. We now represent more than 1,000 workers at USC facilities. New NUHW members at USC. 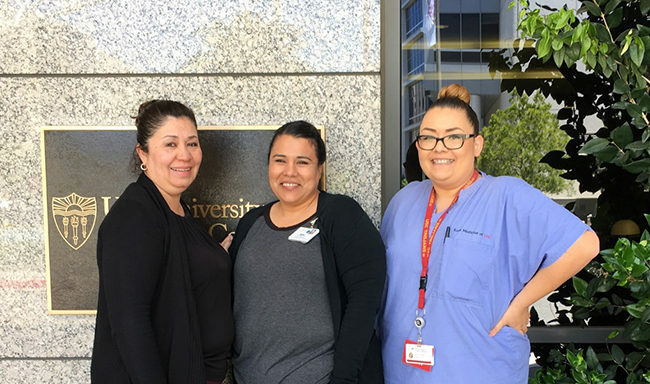 Members at Kindred Hospital San Francisco Bay Area voted by a 91 percent margin last month to ratify a new three-year contract for two separate bargaining units — RNs and technical workers. The agreement provides wage increases of 5 percent the first year and 3 percent each year after for RNs, and 3 percent each year for technical classifications, including special adjustments for several Respiratory Therapists. Dozens of NUHW members and allies converged in Sacramento May 19 to urge lawmakers to support SB 562, The Healthy California Act, a trailblazing bill that would make California the first state to guarantee health coverage for all residents. 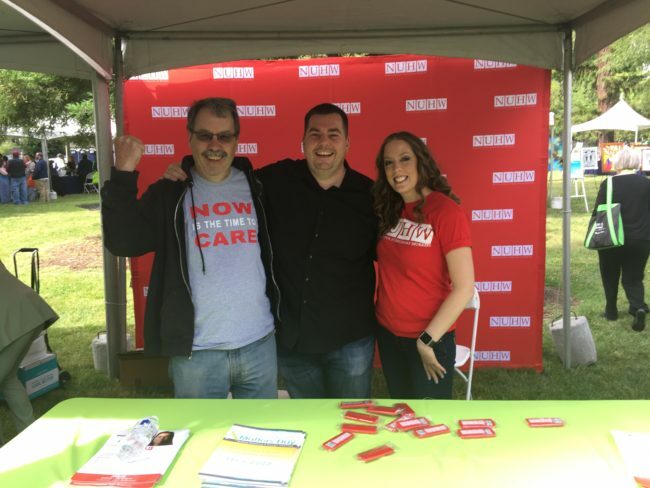 A few months earlier, NUHW leaders in Northern California joined hundreds at a community meeting in Roseville and a rally in Sacramento in support of SB 562. The NUHW Retirees Committee convened a video conference in May between Northern and Southern California retirees. The goals of the committee are to help retirees transition from work to retirement; to spur discussion and action related to retirement security, healthcare benefits, and other social justice issues; and to support former colleagues in their struggles with their employers. For more information, see nuhw.org/retirees. Throughout May, we commemorated Mental Health Awareness Month with a social media campaign highlighting the work of our mental health clinicians with a video and a series of memes for Facebook and Twitter. On May 24, we sponsored a booth at Mental Health Matters Day in Sacramento. NUHW co-sponsored Mental Health Matters Day in Sacramento on May 24. NUHW-endorsed candidates Monica Rodriguez and Gil Cedillo won their respective races in the Los Angeles City Council elections May 16. Councilmember Cedillo won another term representing District 1 with 70.8 percent of the vote. Rodriguez was elected for the vacant San Fernando Valley District 7 seat with 52.9 percent of the vote. NUHW supported both candidates by creating and disseminating videos via our social media channels.